Garlic: The Stinking Rose - Krysten's Kitchen. If you have made any of my recipes or seen my Instagram stories, you might already know that garlic is my absolute favorite food. I put it in every dish that I possibly can! Not just a clove of garlic, but 8 cloves, at least! It’s a good thing that my husband (and my family) loves garlic just as much as I do. i made my Mom's Meat Sauce recipe and used a whole bulb of garlic which was about 14 cloves. Garlic is believed to ward off more than vampires. It also fights off heart disease, cancer, colds and the flu. If what they say is true about garlic and vampires, I have nothing to worry about, because garlic is always in our home and in every dish I make. Besides the fact that garlic tastes amazing, it has some wonderful health-boosting benefits. Garlic has been used for thousands of years even though significant scientific studies have only been developed over the last 50 years or so. I realize that garlic isn’t something that everyone loves the taste of. However, it’s benefits should encourage anyone to at least take garlic supplements. This article and infographic from Delicious Living suggests 1,200 MG daily for immune-supportive effects. If you don't eat enough garlic throughout the day, you might consider taking garlic via supplements. Hippocrates (as my mom would say "a nice Greek boy") often referred to as the father of modern medicine, famously said “Let food be thy medicine and medicine be thy food.” He wasn’t lying! My dad has said that to me for most of my life. About 7 years ago, I fixed a ton of health issues with food. It's a long story, but basically I cut a lot of foods out of my diet that weren't healthy for me. They were foods that you might consider to be healthy but they were hurting me in many ways. Garlic contains a compound called allicin which has incredible medicinal properties. It’s antimicrobial, antiviral and antifungal properties can fight the common cold, and boost the function of the immune system. So if you have a cold or get a cold, increase the amount of garlic you are having in your meals. Of course slathering bread with a lot of butter and adding garlic or garlic salt to it is not at all how this works. Adding garlic to your soups, meats, sauces, veggies and dips is what will help. Allicin, the active compound in garlic, only forms when garlic is crushed or diced when it’s raw. If you cook the garlic before crushing it then it won’t have the same benefits. Something I learned from Delicious Living and Kyolic is that you should allow your garlic to rest for about 5 minutes after chopping it before heating it. According to an article from Authority Nutrition, one study gave 146 healthy volunteers either garlic supplements or placebos for 90 days. The garlic group had a 63% lower risk of getting a cold and their colds were 70% shorter. To get the best benefits from eating garlic, it’s best to either eat garlic raw or to crush or dice it before adding it to your dishes. Use more than 1 clove of garlic per meal. Powdered garlic doesn’t have the same benefits of fresh, raw garlic, though it still tastes good. We often use powdered garlic with raw garlic because there is no such thing as too much garlic. Did you know that California produces more than 250 million pounds of garlic each year? Have you ever driven through Gilroy, California? Gilroy is also known as “The Garlic Capital of the World,” and it smells of garlic and is divine. They even have an annual Garlic Festival in July. • Garlic only contains about 4 calories per clove, so eat away! • French Scientist, Louis Pasteur, promoted the antiseptic, anti-fungal, anti-parasitic and anti-viral qualities of garlic in the 1850s. • Garlic was used in the the Medieval times as a cure for drunkenness and overeating. If you are ever in the San Francisco or Los Angeles area then you must visit one of my favorite restaurants, The Stinking Rose. Everything is garlicy and they even serve garlic ice cream! Oh yes, it’s true! My favorite entree is the 40 clove garlic chicken dish and the fresh, raw garlic spread that they serve with their bread is out of this world! It is simply chopped raw garlic, fresh parsley, and olive oil. My family and I will easily down about a cup of it throughout our meal (see photo of Jeff and me holding the garlic spread below). We have been there a million times as a big family over the holidays or for date nights. 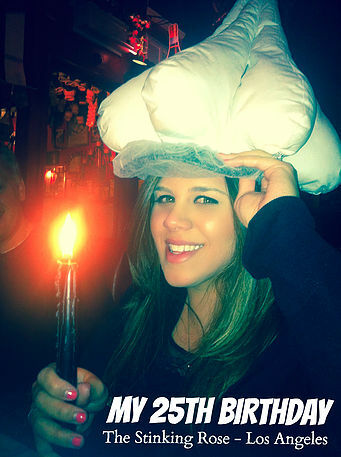 I even celebrated my 25th birthday there and they put a big garlic on my head - HA! Good times. Also, when you go out to eat, don’t be afraid to ask for the chef to add more garlic to your dish. You definitely wont have to ask for that at The Stinking Rose, though. When we go out to eat I typically ask them to add a whole bunch of garlic to my dish, or ask for a bunch of raw garlic on the side… that way I know it’s raw. Sometimes they will only give me about a clove’s worth because I am pretty sure that is the amount that the average person can tolerate. I just let them know that I love garlic and politely ask for about 8 times that amount. You can never have too much garlic, in my opinion, and a meal without garlic isn't a meal at all... unless you are allergic and that I totally understand. It's important that when cooking for other people, especially if you do cook with a lot of garlic, that you ask if your guests are okay with garlic and how much garlic they are okay with. • If you like the taste of raw garlic, throw the garlic in last before serving your meal. • Add garlic to everything you possible can. • Use THIS tool to peel the garlic, you will thank me later. • Use a “Slapper Chopper” to chop your garlic. It’s quicker and it won’t leave that garlic smell on your hands. The Cuisinart chopper is my favorite garlic tool. I hate chopping garlic because of the lingering smell it leaves on the fingertips. The green tool from OXO is one of the best garlic peelers ever. It removes the skin of the garlic clove with minimal effort. Both are found on amazon. Not at all on the healthy side of things, we just went to a San Francisco Giants Baseball game and, boy, do they have the very best garlic fries ever. My husband and I just had to get some and even asked them to pile on some extra garlic for us. Thankfully, they did! While this isn’t the best way to add garlic into your daily life, once in awhile, a really good order of hot, fresh garlic fries can really brighten your day… even when your team loses! Celebrating its 25th year…The Stinking Rose continues to season its garlic with food. While the menu has changed through the years there are items that cannot be removed for fear of an uprising—the signature dish of 40-clove garlic chicken, roasted rabbit, bagna calda with house made focaccia buns and, of course, garlic ice cream with chocolate sauce. Back in 1991, Jerry Dal Bozzo was busy with his North Beach restaurant, Calzone’s, which he had opened in 1986, but being the consummate entrepreneur, he was not content to operate just one unique restaurant. He had an idea that stayed with him from years before when he went to Gilroy and tasted garlic at the Gilroy Garlic Festival and saw how popular it was—a restaurant that specializes in all things garlic. He talked to other restaurateurs and tried to get them to open a garlic restaurant so he could pursue other ideas he had. One of the people he talked to, Dante Serafini, a fellow San Francisco/North Beach native who had sold his business to Jerry for the Calzone’s site, finally said “if you’ll do it, I will do it with you”. And the rest, as they say, is history! They found a location on Columbus Avenue, the tiny restaurant formerly Little Joe’s Restaurant. It had become Café Americain in the intervening years but closed for two years by then and was in need of a new life. They opened the doors on July 3, 1991 and armed with a menu featuring the pungent herb in most of the dishes, the restaurant found a legion of fans who came from day one and continue to flock to the restaurant twenty-five years later. Herb Caen gave the restaurant his blessing with an “only in San Francisco” nod. The restaurant expanded as the businesses on either side closed their doors. The walls of the upstairs dining room were hand-painted by a local artist, Chuck Kennedy, depicting San Francisco scenes populated with garlic characters. In 1996, the two partners opened The Stinking Rose in Beverly Hills prompted by an article that appeared in the LA Times about famous Los Angeles Restaurants—strange as it may seem, it claimed that one of the most popular restaurants in Los Angeles was The Stinking Rose in San Francisco! The restaurant welcomes people from all over the world who find their way to the Columbus Avenue location with their GPS guiding them to the place where “we season our garlic with food”. Visitors have included many celebrities and dignitaries from Robert Downey, Jr. and Tony Bennett to King Abdullah of Jordan. The company also operates Calzones, the Franciscan Crab Restaurant, the Crab House at Pier 39, The Old Clam House, Osso Steakhouse, all in San Francisco; Salito’s Crab House & Prime Rib in Sausalito, The Dead Fish in Crockett and The Stinking Rose in Beverly Hills. 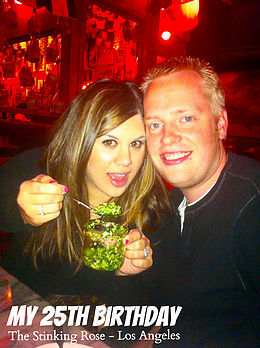 The Daily Meal: For the Love of San Francisco - San Francisco stinks...at The Stinking Rose garlic restaurant. "At this point, we needed lunch, and what better place than San Francisco’s The Stinking Rose, a garlic restaurant that even puts garlic in its ice cream. The weather was so stellar that we decided to walk off our garlic noodles and neon ravioli and head to the next tour: Muir Woods with Tower Tours. " San Francisco's Stinking Rose incorporates garlic into almost every item on the menu, which explains the slogan, "We season our garlic with food." The world's largest garlic braid along with 2,635 other garlic bulbs decorate the ceiling, helping it live up to its name. The restaurant takes garlic to new places by including it in dessert items, such as Gilroy's Famous Garlic Ice Cream. According to co-owner Jerry Dal Bozzo, the Bagna Calda ("garlic soaking in a hot tub") is one of the most popular items on the menu. He also told CNBC.com that the staff takes the garlic out of dishes upon request, transforming it into what he refers to as "Dracula's food." CSUDH - "A Stinking Good Meal"
"Don't let the name scare you away from this treasure. The Stinking Rose delivers an unusual culinary experience ... I definitely recommend The Stinking Rose. It is fun, funky, and eclectic and worth a try." SF Giants Manager, Bruce Bochy, visits The Stinking Rose, San Francisco after winning the World Series 2012. "I just wanted to express my thanks for the wonderful experience my lady and I shared at your restaurant last evening. Our reservations were at 7 and our hosts were very pleasant and courteous! The food was outstanding and the service excellent. I do not usually take the time to write to restaurants regarding my experiences, but was motivated by the fact that Everything your staff did to make our visit great, was accomplished." "King Abdullah II of Jordan had lunch Friday at The Stinking Rose, which was surrounded for the occasion by representatives of the California Highway Patrol, the San Francisco Police Department, a herd of black sport utility vehicles and about 25 security guards. It was his fourth visit to the restaurant ... "
"Willem Defoe recently shared sizzling skillet mussels and steamed garlic clams with a girlfriend at The Stinking Rose on Columbus. Tablehopper notes the garlicky choice of venue is appropriate given Defoe's role in vampire flick Daybreakers ... "
"One-and-a-half tons of garlic and 12,000 mints a month! This is a fun place, one that takes itself not too seriously but not too lightly either. It's dedicated to gustatory enjoyment ... ."
"Voted one of the best New American restaurants 2010." I’m not joking. It’s as though they were all trained to give equal treatment to all restaurants. And, as we know, all restaurants are not created equal. That’s why you need a name. A presence. A reputation. Something that makes you stand out. We did get some good suggestions on Twitter, but they were all too far away for our allotted time. Finally, a text came in from a friend who knew the area and said, ‘Go to the Stinking Rose. Some friend, we thought. Then we checked it out—sure enough, it was a real place, in North Beach’s Little Italy. It was the name that did it. You have to check out any place with a name that distinctive. If they can interest you with their name, can they do the same with their food? The place is, by its own definition, whimsical. There are nooks and crannies and hidden booths. There are mirrors, and a great design on the menu—reminiscent of Gypsy Rose Lee-style burlesque. There is the world’s largest garlic braid (bulb after bulb of garlic tied together and strung like holiday lights across the ceiling). Garlic, garlic, everywhere. And not a vampire in sight. It’s a place that delivers on its trademarked phrase, ‘We season our garlic with food®’. We started with the Bagna Calda, described as ‘garlic soaking in a hot tub.’ It actually turned out to be cloves of garlic with a little anchovy, roasted and resting in a light olive oil, ready to smash and spread on fresh rolls that had been lightly dusted with cheese and, of course, garlic. We shared bites of various house specialties, including the Forty Clove Garlic Chicken (our hands down favorite), which really did have 40 cloves of garlic. We ate the Zuppa di Pesce with mussels, crab, fresh fish, calamari and shrimp—bib included. We thoroughly enjoyed the Gnocchetti, with garlic gorgonzola and asparagus. We had the Spicy Prawns, with fettuccine, pancetta, and onions in a red pepper garlic oil. We sampled the arugula salad with garlic dressing and pine nuts. We finished off the meal with garlic ice cream. Before you gag, just know that the flavor was good enough that the brave soul who took the first bite then clutched the dish and said, ‘OK, you guys. Get your own.’ It’s that good. Turns out the ice cream comes from Gilroy, CA, home of the Gilroy Garlic Festival, with a little Ghiradelli chocolate sauce added. The mix of sweet and savory really is memorable, and a nice finish—especially for those who want to retain the taste of garlic when they walk out. Which you probably would, regardless. But who cares, when you all had the same amount of garlic? (OK, maybe your cab driver will notice, but then he’ll remember where to refer the next person who asks, “Where should we go to eat?”). So, we walked out smelling like garlic, clutching the Stinking Rose cookbook, and wondering how many times we could go back while we’re in town. When we do go back, we’ll be asking for Andrew. After all, when you select a restaurant, it’s nice to have a name. "It was the Romans who christened garlic the stinking rose apparently (you learn a lot about stuff while here) and I am sure they would beat a straight path to this place if it had existed. You should too." "Top 10 restaurants in the country to take your man to! This one is really special...if you love garlic, you will have a blast here. I must mention, garlic is good for your health!" "I can recommend The Stinking Rose to all who want a unique dining experience. The service throughout the evening was pleasant and capable. The restaurant has starring role in the show, and I put The Stinking Rose near the top of the list of places to bring large parties and out of town visitors. The decor, and the themed rooms have something for everybody. Not to be outdone, the food is as entertaining and flavorful as the surroundings." "While in North Beach, no environmentally aware visitor should miss a meal at The Stinking Rose, the restaurant which shares a fifties-bohemian ambience with nearby Hotel Boheme and City Lights but which seasons that ambience – and virtually every dish on the menu–with fresh, pungent GARLIC – lots and lots and lots of it ..."
"We Love: Experience San Francisco’s restaurant scene at one of its more bizarre eateries- The ‘Stinking Rose’, a ‘garlic restaurant’ in Little Italy. Not one for vampires, the restaurant serves 3,000 pounds of the pungent herb every month, and the quirky dining hall is decorated with the world’s longest garlic braid. Luckily the food – a mix of Italian and American dishes, doesn’t stink (although the garlic ice cream is an acquired taste) and there are non-garlic options available ..."
"The name of this Little Italy restaurant in San Francisco is not an overstatement. This place stinks, in fact reeks of garlic. It is certainly not a restaurant for the sensitive nose, weak taste buds or the unadventurous eater ..."